Mei Ling Hopgood was born in Taiwan, abandoned immediately by her birth parents, adopted as a seven-month-old by a white North American couple, and raised in an opportune-rich, predominately white, middle-class suburb of Detroit, Michigan. She was “a little spoiled” by her adoptive parents, but lovingly so, and she was taught that she could be whatever she aspired to be if she simply applied herself. As she was growing up, she often felt a little “different” than people in her surroundings, but she was never shut out from social circles or discouraged to go after and achieve any of her goals. Sometime during her 23rd year, after she graduated university and was well on her way to a successful career in journalism, she received a phone call that connected her to her birth family. Whence, this lucky girl’s story begins and proceeds on quests for her familial and cultural roots, her full identity as an Asian US citizen, and the reasons why she was put up for adoption. 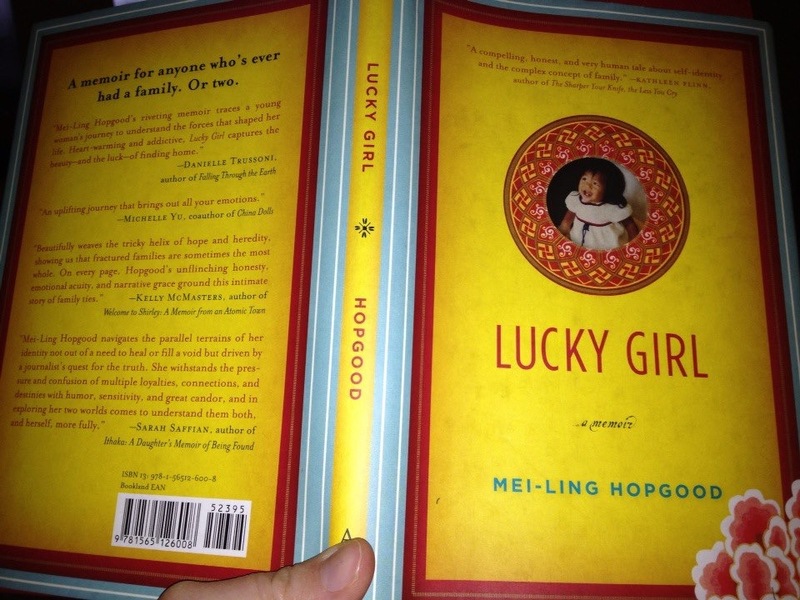 Hopgood’s memoir, Lucky Girl, is compelling enough that the reader is hooked into the book during the first scene in the prologue and completely drawn into the story by the middle of chapter one. Hopgood’s attractive personality and friendly voice permit the reader to idolize her and empathize with her. Early in the book, Hopgood deploys non-intrusive switchings of narrator viewpoint, so that by chapter three, it is clear that this story is not only Hopgood’s, but also her birth family’s, her adoptive family’s, and her adoption facilitator’s. Like any great journalist, Hopgood is non-judgmental when giving the initial facts of a story. She shows situations, scribes letters, and repeats conversations, allowing the reader to judge who is good and who is bad. If she is hard on anybody, she is hard on herself, often self-effacingly revealing her own faults. As the story progresses she becomes more opinionated, but then, so does the reader. What initiates as a search for her past, becomes for Hopgood, an opening of Pandora’s box. Demons are released, and in the process, nerve endings are exposed, blanketed emotions are uncovered, and closeted secrets dragged into the light. Hopgood writes wonderfully well. She tells a grand tale. Her writing style is earthy, cultured, and polite. The book is, for the reader, an education in mores, socialization, and the resiliency of the human soul. Whatever crisis befalls the narrator, whatever ugly secret she unearths, whatever tragedies happen to her families’ members, the book remains a spiritually uplifting read.